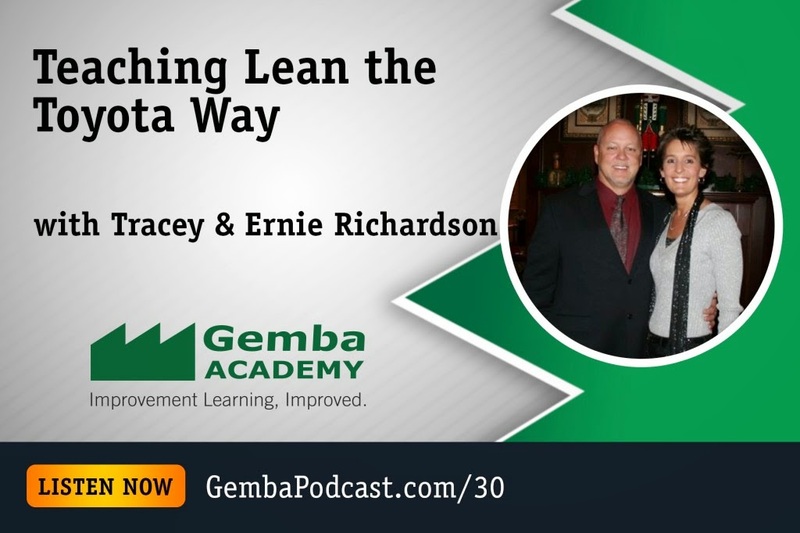 Live Podcast Interview- Teaching Lean the Toyota Way with Ernie and myself by Gemba Academy! I'm very excited to share with you a live Podcast interview by the Gemba Academy w Ron Pereira. He interviewed Ernie Richardson (my husband) and myself about various aspects of lean, culture, TPS, usage of tools, our learning's from our Japanese trainers and much more!! We were honored to be considered by Gemba Academy! Thank you for the opportunity! Hope everyone enjoys!!! Click the shortened link below! What is the difference between Visual Management and Visual Control? This month my blog post comes from theleanedge.org again. The question of the month was - What is the difference between Visual Management and Visual Control. Please take a look at Michael Balle's website to view other Lean practitioners! I will answer your question regarding visual control versus management based on how some of my Japanese trainers, coordinators and leaders articulated it to me and how I personally practiced it during my time at the TMMK plant in hourly and salary positions. This question comes up all the time and it can turn into semantics very easily, similar to asking someone what are the 5S’s. I think there are 20 different versions out there, the explanation and purpose of it become crucial. So I like to look at visual control as the “micro” side of the fence and visual management as the “macro” side. Let me explain. So when I was a team leader in Plastics at TMMK, particularly to the Headliner group I was working for, each morning/afternoon I would have many granular visual control type charts I had to fill out/document to allow me to understand (perhaps hourly to daily) how my processes and equipment were running compared to the known standard per each condition. I may have to record oven temperatures before shift, after lunch and at the end of shift, robot calibrations at start up to the specific cc’s (cubic centimeters) that was expected to create a quality part. Other examples could be first piece checks at start up (and after breaks and lunch) to give me to have a set of parameters within a 2 hour window when something may have changed. These were all micro level visual control mechanisms at the process level to help team members at a process level to know where they were compared to ideal state/standard in all scenarios. Some have often asked me if using “yellow tape” to visualize where something should be placed fall under visual control and I would say “yes”, 5S type visuals like shadow boards are visual control mechanisms to see abnormality at a glance. All necessary to determine how we manage to the process and upward. Visual Management is a more macro vision of the process supported by all the visual control charts in place that should cascade upward to higher level goals (KPI’s). Some of my colleagues have mentioned Floor Management Development System (FMDS) and Toyota Business Practices (TBP) (PDCA described in 8 robust steps). FMDS is a visual management system that displays the KPI’s at a group which supports the department visual boards, and upward to the plant level. The group level needs the “process” visual controls to determine which indicators are pertinent to track on a daily and weekly basis. In headliner we may track the top 3-4 discrepancies common for that part (tears-adhesive issues, misaligned brackets and delamination). Now these are somewhat (lagging KPI’s-results) because they happen within our process (a defect if you will), we want to dial in on the group visual control measures (leading KPI’s-process) to minimize these quality issues and become more predicative in nature–it’s how we control to the standard. So we would know how the headliner group is doing in regard to Plastics process KPI’s as a department and upward to the plant hoshin KPI’s. As Jon described nichijo kanri which is daily management – kanri cycle is micro PDCA cycles (TBP thinking process) that have to happen hourly / daily and in some cases with our andon system (problem awareness) every second or minute. So really if you want to cascade the hoshin level KPI’s downward and have a catch ball effect upward to from the floor then visual control mechanisms are crucial to visual management at all levels. That is true hoshin kanri (strategy deployment). The beauty of FMDS is that it involves the people development side that engages every process owner allowing them to understand at a granular level how they contribute to the immediate KPI’s as well as the department and sometimes plant levels. Visual control isn’t just about manufacturing like many think. If you create an output, service or product that has internal or external customer expectations then you can develop visual control process measures to tell you when you may or may not be meeting the expectations. A combination of leading and lagging KPI’s can be created by an organization to react initially but the ideal state is to be more predictive and make changes to the process (visual control) in order to manage the results. My Japanese trainers would always encourage us to first look at the process (visual control) to get results, its just the best way to manage that allows you to be predictive before defects/discrepancies happen. Visual Control and Visual Management are a piece of a larger pie I call “the cultural infrastructure” that develops the DNA (discipline and accountability) in each team member in the organization to recognize their line of sight to the goals therefore contributing not only to their own job security but the long term sustainability and growth of a company.